Click any of the thumbnail images for a higher resolution, full-sized jpeg. St. Clara's Academy opened its doors in 1852 in Benton, Wisconsin. The Academy offered young women courses in music, fine arts, sewing, stenography, and numerous European languages. The Academy was, in its time, “the oldest chartered institute for the Education of Girls in the Northwest.” By the end of the 19th century, however, the community realized that there was a desire for a higher level of education. St. Clara College, Sinsinawa, Wisconsin, opened its doors in 1901. The remoteness of the site led the Sinsinawa Dominican sisters who ran the college to begin, as early as 1914, to look for a site near a large metropolitan area. The sisters considered Omaha, Minneapolis and Chicago. Archibishop Quigley of Chicago replied to a request from Mother Samuel, prioress of the sisters. He said that if she named the locality or localities in which the congregation wished to build, he would present the case to the council. By 1916, Archbishop Mundelein placed the request before the council and then invited the sisters to build the college in the Chicago diocese. Plans were drafted; however, World War I intervened. Although the property in River Forest was purchased, building did not begin until 1920. The original buildings were designed by Ralph Adams Cram, a renowned neo-Gothic architect. The first building opened in October 1922 — three classes came from St. Clara College and a freshman class was added. The thirty-nine sisters comprising faculty and staff came from Sinsinawa to open the new college which became Rosary College. The college received accreditation from North Central in March 1923. During the first three years the college received full recognition from the Catholic University of America; the Catholic Educational Association; the North Central Association of Colleges and Secondary Schools; the Universities of Illinois and Wisconsin; The Association of American Universities; The Association of American Colleges, and The American Association of University Women. Enrollment grew steadily each year. Rosary's Fribourg, Switzerland, junior year abroad program opened to undergraduates in 1925. A strong classical program continued in the college and included work in library science. In 1926 Rosary High School moved into its own building, freeing up space for Rosary's social and educational programs. In 1929 William Harold Lewis, a Chicago industrialist, made a gift to the college for building an addition to the original cluster. This new hall was to provide the campus with needed administrative offices and classrooms. Lewis Memorial Hall, as designed by Ralph Adams Cram, followed the Gothic architecture of the first campus buildings. During the 1930s, in deference to the continuing burden and social problems placed upon Chicagoans during the great Depression, Rosary decided to offer classes in the evening free of charge for all adults. Another unusual program began with courses offered undergraduates by the Catholic Evidence Guild under the eye of Monsignor Hildebrand. Over the course of several summers in the 1940s, three or four students spent several weeks Street Preaching in Oaklahoma. In 1941 the Honorable Myron C. Taylor gave his Villa Schifanoia to his Holiness Pope Pius XII who assigned it to Rosary College for educational purposes according to the wishes of Mr. Taylor. A fine arts building was dedicated in 1952 which provided the campus with an auditorium, recital hall, and facilities for the music and drama departments. under the Housing and Home Finance Agency, a government loan was arranged for a new dormitory. 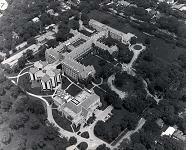 The increased dormitory accomodations for students were available by September, 1961. A modern library building, which provided housing for the Graduate School of Library Science (as it was known at the time), was made possible by funds received from a grant under Title I of the Higher Education Facilities Act of 1963 (link to the higher-ed.org website, which provides scans of the original document). The chief benefactor was Col. Henry Crown, and the building was named Rebecca Crown Memorial Library in memory of his wife. In 1971 the Semester-in-London program began for undergraduate students which further expanded the emphasis given by the college to the value of foreign study. The first graduate degrees granted by Rosary College were in library science. In 1930, a Department of Library Science had been established, and in the fall of 1949 the first students were accepted into the program leading to the MLS degree. This graduate program brought the first male students to the campus. It was not until 1970 that males were admitted at the undergraduate level. Rosary as a liberal arts college had gradually over the years accomodated its curriculum to the desires of its students, and curricular changes show professions and occupations opening to women. In 1965, a four-year BA/MA program was adopted in English, French, history and philosophy. The program was discontinued in 1985. Ever since Rosary offered the free public Education for Leisure program in the 1930s, Rosary has been involved in adult education. In the 1960s a program for continuing education was developed with a focus for women over 25 who wished to begin or to continue an interrupted college education. The fall of 1977 brought two new opportunities for graduate study on the River Forest campus — courses leading to a Masters in Business Administration, and a Masters of Science in Learning Disabilities (which today is known as Dominican University’ School of Social Work). In 1989, the Graduate School of Business and the Graduate School of Library and Information Science partnered to initiate a degree for a Masters of Science in Management Systems. Text by Sister Jeanne Crapo, O.P.